On average, you will save 15% – 25% off the retail price of brand name drugs and an average of 15% – 60% off the retail price of generic drugs. Download your FREE card today! Paying for your medications shouldn't feel like highway robbery. According to a 2015 CDC report, nearly 1 in 10 U.S. adults did not take their medication as prescribed in order to save money. For most Americans, forgoing their prescriptions isn't a choice. For those who can't afford their prescriptions or those who just want a better deal, CarefreeRx is here to help. When you sign up for the CarefreeRx Prescription Discount Card, staying healthy and saving money are one and the same. The CarefreeRx Prescription Discount Card gives you access to discounts on most generic and brand name prescription drugs. We work with pharmacies to get you the lowest price for your prescriptions. The best part? It's completely free! Drug prices vary between pharmacies. CarefreeRx collects pricing data for prescription drugs at more than 62,000 participating pharmacies nationwide so that you can find the lowest price for your medications. On average, you can save 15% to 60% off the retail price of generic drugs and average savings from 15% to 25% off the retail price of brand name prescriptions each time you fill your prescription with the CarefreeRx Prescription Discount Card. CarefreeRx is easy to use. Simply sign up, download your card and show it to a participating pharmacist when you pick up your prescription. You can even start using your card today! Click here to sign up for a FREE CarefreeRx Discount Card. No waiting, no snail mail. You can even start using your card today! Just show your card to your pharmacist and receive instant savings. 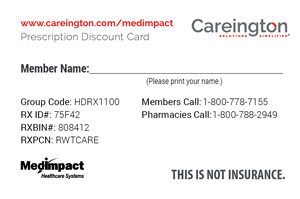 The CarefreeRx Prescription Discount Card is not insurance. Carefree Rx allows you to compare the prices you currently pay for your medicine with Carefree Rx prices to help you save on your out-of-pocket expenses. Sign up today to begin receiving instant savings! * Even if you have prescription benefits through your health insurance, you should compare the costs of the two programs to determine the most savings for you. The CarefreeRx Prescription Discount Card is accepted at pharmacies nationwide, including major chains and independent retailers. Before you head to your pharmacy, make sure you're paying the lowest price for your prescription. Taking care of your family means taking care of your pets, too. Take care of every pet in your home with Spree Pet Care, a savings plan designed to keep all your pets happy and healthy. Members save on veterinary services, pet services, supplies and more. 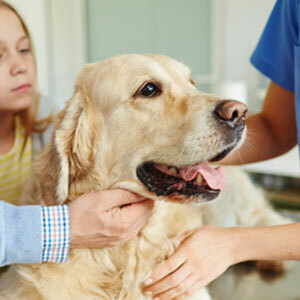 Spree Pet Care can be used at many participating veterinarians and providers nationwide. Identity theft is on the rise and very difficult to recover from. Get peace of mind with complete identity theft protection from CareShield. 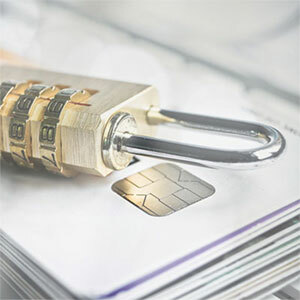 CareShield offers state of the art tools to protect your identity and provides restoration services in the event that identity theft does occur. With CareShield, you're completely protected. This plan does not meet the minimum creditable coverage requirements under M.G.L. c. 111M and 956 CMR 5.00. This plan is not a Qualified Health Plan under the Affordable Care Act.. This is not a Medicare prescription drug plan. The range of discounts will vary depending on the type of provider and service. The plan does not pay providers directly. Plan members must pay for all services but will receive a discount from participating providers. The list of participating providers is on this website. A written list of participating providers is available upon request. Discount Plan Organization and administrator: Careington International Corporation, 7400 Gaylord Parkway, Frisco, TX 75034; phone 800-441-0380.